The Yankees played like kings of the road in the early going. They won 10 of their first 13 games away from Yankee Stadium this season and as late as May 11 were still playing over .700 ball on the road with a 12-5 mark (.706). Since then, however, the road has been unkind to the Yankees, who are 2-10 since that point and with Sunday’s 3-0 defeat at Oakland their away record fell under .500 at 14-15 for the first time this year. Overall, the Yankees are only one game above .500 with a 26-25 mark as they dropped into a first-place tie with Tampa Bay in the American League East. And it won’t get any smoother in their next stop, Seattle, where they face the league’s most dominant pitcher, Felix Hernandez, Monday night at Safeco Field in a match-up of staff aces and former teammates as Michael Pineda will seek to turn the Yanks’ fortunes around. It will be Pineda’s first start at Seattle since the Mariners traded him to the Yankees in January 2012. The Yankees were shut out for the second time this season Sunday as Jesse Chavez out-dueled Adam Warren. Chavez, who despite a 2.11 ERA improved his record to merely 2-5, held the Yankees to seven hits, all singles, with no walks and six strikeouts in eight innings. Alex Rodriguez got the Yanks’ ninth hit, another single, in the ninth off Tyler Clippard, who kept them off the board for his sixth save. For Warren, it came down to one bad pitch, a 1-1 fastball in the sixth inning to Stephen Vogt, who drove the ball over the right field fence for his 11th home run and a 2-0 lead. The Athletics had scored a total of six runs in Chavez’s seven previous starts, so he is accustomed to minimal support. Also scoring on Vogt’s homer was Billy Burns, who led off the inning with a single and stole second and third. The steals ended a stretch of 106 2/3 innings since May 23 last year since a base runner successfully stole against Warren. Vogt struck again in the eighth inning with a sacrifice fly off Jacob Lindgren that scored Burns, who had singled with one out off Esmil Rogers and crossed to third on a single by Ben Zobrist. Vogt and Burns did plenty of damage to the Yankees in the series. Vogt had 5-for-14 (.357) with two doubles, one home run and five RBI. Burns was 9-for-18 (.500) with a double, a homer, an RBI, two stolen bases and six runs scored. They were chiefly the reasons the Yankees dropped three of the four games at O.co Coliseum where they have lost 10 of their past 12 games, another series of bumps on the road. Not a lot of good stuff has happened to the Yankees in Oakland recently, so Saturday night’s 5-3 victory over the Athletics was more than welcomed. It was only the third victory for the Yanks in their past 13 games at O.co Coliseum. Carlos Beltran, finishing up a productive May, came up big for the Yankees and helped them overcome a shaky outing by Nathan Eovaldi. The righthander gave up three runs and 11 hits in 4 2/3 innings, but Beltran’s bat triggered the Yankees’ comeback. Eovaldi is tough to figure. He can ring up the radar gun with the best of them, but hitters seem to be able to make good contact against him. Eovaldi has allowed 76 hits in 57 1/3 innings with opposing hitters batting .325 against him. Considering all the base runners the A’s had while Eovaldi was in the game, the Yankees were lucky to be trailing by only one run, 3-2, when the game turned in their favor in the sixth inning. That was due in part to some first-rate defense by Ramon Flores in his major-league debut. Playing left field as Brett Gardner moved to center, the Triple A Scranton/Wilkes-Barre call-up got in the mix right away as he protected a 1-0 lead in the first inning with a strong throw to cut down Marcus Semien at the plate trying to score. Catcher Brian McCann made a splendid play in gloving Flores’ throw slightly up the line and swipe tagging Semien a moment before he reached the plate. Big Mac had put the Yankees in front in the top half of the inning with a two-out, RBI single that ran his hitting streak and RBI streak to eight games each. In the second inning, Flores made a diving catch in foul territory after a long run of a drive by Eric Sogard. But there was nothing Flores could do to save Eovaldi from himself when he gave up four hits and two runs in the third inning. A two-out single in the fourth by Semien pushed Oakland’s lead to 3-1. The Yankees were stymied by Jesse Hahn, who recorded 10 outs in a row before Jose Pirela singled on a ball that Sogard playing second base bobbled. Third baseman Brett Lawrie dropped a hard liner by Brett Gardner for an error, and Chase Headley got a clutch single to bring the Yankees to 3-2. Eovaldi’s night was over after he gave up a two-out single in the fifth, which removed any chance he had of getting a winning decision since he did not last five full innings. The bullpen then did a masterful salvation job. Chasen Shreve struck out all four batters he faced and was the pitcher of record on the winning side when the Yankees moved in front in the sixth. Pitching too carefully to McCann, Hahn walked him on four pitches. Beltran then clobbered a 0-1 fastball over the center field fence for a 4-3 Yankees lead. Beltran’s fourth home run of the season was the only extra-base hit of the game. The other nine hits by the Yankees and all 12 by the A’s were singles. Beltran wasn’t finished, either. The Yankees got an insurance run in the eighth, thanks to smart base running by Mark Teixeira. No one would mistake Tex for a sprinter, but when the A’s did not hold him close at first base after a leadoff single he stole second. After an infield out moved Teixeira to third base, he scored on a single to left by Beltran. After an April in which he batted .162 with five doubles, one triple and seven RBI, Beltran has turned his season around in May in which he is hitting .308 with seven doubles, four home runs and 14 RBI. With a lead in place, the pen took it from there. Justin Wilson got the first two outs of the eighth. Dellin Betances got three of his four outs by strikeouts. Andrew Miller pitched a 1-2-3 ninth to make it 15-for-15 in saves. In all, four Yankees relievers faced 14 batters and retired 13 of them, eight by Ks. A right-handed pitcher, Jesse Hahn, was starting for the Athletics Saturday night, but left-handed swinging Stephen Drew was on the bench for the Yankees. This should come as no surprise, of course. Drew is struggling through another offensively-challenged season, one year after batting a combined .162 for the Yankees and the Red Sox, the lowest figure for any player in the major leagues in 2014. All the time Drew missed before finally signing a contract in late May with no spring training behind him was believed the fault for his severe drop-off in offensive productivity. That excuse cuts no ice this year, however. Drew, signed in the off-season to a one-year, $5-million deal to be the Yankees’ full-time second baseman and occasional shortstop and now even a backup third baseman, had a full training camp with the team and has started 40 of its first 50 games. His batting average is down to .158, even lower than last year’s, in 152 at-bats. This is no longer a small sample size for Drew. He has had 292 at-bats over the past two seasons with the Yankees and hit .154. He is hitless in his past 19 at-bats and is also on stretches of 1-for-26 and 2-for-35. A scout I spoke to last week said that Drew has been guilty of trying to hook pitches to take advantage of the short right-field porch at Yankee Stadium. Yet in recent games he seems to have mended those ways and has looked to take the ball to the opposite field with weak fly balls to left the result. Taking Drew’s place in Saturday night’s lineup was Jose Pirela, who had offensive woes of his own. The rookie has one hit in his past 16 at-bats and is hitting .200 in 30 at-bats. Yankees manager Joe Girardi did not say a change is necessarily in the making, but it is clear the club needs more offensive spark from the middle of the infield than it has been getting this season. Shortstop Didi Gregorius took a .210 batting average into Saturday night’s game. It was only three years ago that those positions were manned by Derek Jeter and Robinson Cano, which should be an indication of the kind of fallout with which the Yankees are dealing. The schizophrenic nature of the Yankees’ season has surfaced again on the West Coast. After sweeping a three-game series against the Royals, the team with the best record in the American League, the Yankees lost the first two games of the four-game set to the Athletics, the team with the worst record in the league. On top of that, Oakland entered the series with a 1-10 record when opponents start a left-handed pitcher, and the A’s won Thursday night against CC Sabathia and Friday night against Chris Capuano, both lefties. Except for the hitting of Brian McCann and Alex Rodriguez, the Yankees have had another offensive breakdown. The loss of Jacoby Ellsbury (strained right knee) is part of it, although Slade Heathcott, who was recalled from Triple A Scranton/Wilkes-Barre to help fill the void, was playing well (.353, 1 HR, 3 RBI). Now Heathcott is out with a strained right quadriceps that landed him on the 15-day disabled list Saturday. The Yankees recalled outfielder Ramos Flores from SWP to take the place of Heathcott, who is expected to be out for a month. McCann has homered in four straight games, the longest streak by a catcher in the major leagues this season. Mac is one of two Yankees to homer in four straight games while playing catcher since 1957. The other was Mike Stanley (four homers in four games July 20-25, 1993). The only Yankees catcher since at least 1914 with a longer streak is Hall of Famer Bill Dickey, who hit six home runs in five games June 20-25, 1937. During his seven-game hitting streak, McCann is 9-for-23 (.391) with six runs, 1 double, four homers, 11 RBI and six walks. He has reached base safely in 15 of his past 29 plate appearances for a .517 on-base percentage. The Elias Sports Bureau reports that McCann is the first Yankees catcher with an RBI in seven consecutive games, all as catcher, since Hall of Famer Yogi Berra had an eight-game streak Sept. 11-23, 1956. McCann’s streak is the longest RBI streak by any Yankees player since Alfonso Soriano’s seven-gamer Sept. 1-7, 2013. Mac is tied with the Padres’ Derek Norris for second among MLB catchers with 32 RBI in 2015. The leader is Oakland’s Stephen Vogt with 35. Vogt played first base Friday night and drove in two runs with a double in the A’s four-run third inning against Capuano. Also streaking is Rodriguez, with an eight-game stretch in which he has hit .414 with seven runs, one double, one home run, five RBI and three walks in 29 at-bats as his batting average has climbed from .246 to .277. A-Rod has hit safely in 13 consecutive starts and is batting .346 in his past 15 games and 52 at-bats overall since May 13. Rodriguez’s sacrifice fly Thursday gave him 1,996 career RBI to tie Barry Bonds for second place on baseball’s all-time list, according to Elias, the official statistician of MLB. Statistics found on MLB.com and baseball-reference.com are not official stats. The RBI became an official statistic in 1920. Rodriguez passed Hall of Famer Lou Gehrig (1,993) for the all-time AL RBI record with a three-run homer Wednesday at Yankee Stadium. A-Rod has scored 1,947 career runs, two shy of tying Hall of Famer Stan Musial for eighth place on the all-time list. Despite the two losses in Oakland, the Yankees remained in first place in the AL East by one game over the Rays and Orioles, who are playing each other this weekend. The Yankees will also get some reinforcements when Masahiro Tanaka returns to the rotation. He is scheduled to start Wednesday in Seattle in the last game of the trip. The rotation could use a shot in the, well, arm. Yankees starters are a combined 18-19 with a 4.29 ERA, which ranks 20th of 30 major-league clubs. The Yankees are the only club with a winning record (25-24) whose starting unit has a losing mark. Opposing hitters are batting .275 against Yankees starting pitchers. One could certainly say that Michael Pineda cleaned up his act Wednesday. In his prior start, the righthander had a disastrous seven-run inning against the Rangers that included a couple of errors, including one by himself. Very sloppy indeed. There was none of that in Wednesday’s outing as he pitched the Yankees to a 4-2 victory that completed a three-game sweep of the Royals, who have a much more tortuous lineup than that of Texas. Pineda’s work was part of a complete turnaround by the Yankees in the homestand. As bad as they looked in losing three games to the Rangers, that is how good the Yankees looked in winning three games from the Royals and regaining sole possession of first place in the American League East and reminding Kansas City how much more comfortable it is in the AL Central. That is where Pineda comes in, following quality starts from Adam Warren Tuesday night and Nathan Eovaldi Monday. Pineda gave up a first-inning home run to Mike Moustakas on a changeup and then slammed the door two outs into the seventh inning before he was victimized by the pitch-count police. Girardi is known to be cautious with pitchers, particularly someone like Pineda, who has had two major surgeries. The key for Pineda was a return of his slider, which was missing entirely from his prior outing. He worked on some mechanical adjustments in his between-starts bullpen sessions. The results were positive. He allowed five hits other than the Moustakas homer and only one walk with eight strikeouts. While Masahiro Tanaka was having a rough injury-rehabilitation start for Triple A Scranton/Wilkes-Barre at Pawtucket (3 innings, 4 hits, 3 earned runs, 2 walks, 4 strikeouts), Pineda was pitching like a staff ace in improving his record to 6-2 with a 3.36 ERA. Brian McCann got the Yankees even with a solo home run in the second off the other Chris Young, and Alex Rodriguez made it 4-1 the next inning with a three-run shot that raised his career RBI total to 1,995 to break Lou Gehrig’s AL career record. The long ball resurfaced for the Yankees in the series. They totaled six home runs in their six-game losing streak. They homered eight times in the three games against KC. Pineda worked out of tight spots in the fourth and fifth innings and stranded two runners on base each time. He was particularly impressive in the fifth after Carlos Beltran misplayed a liner by Paulo Orlando into a double and Alcides Escobar singled. Pineda bore down and struck out Moustakas on a slider (no changeup this time) and Lorenzo Cain on an even nastier one. An errant throw by shortstop Didi Gregorius led to an unearned run off Dellin Betances in the eighth (his stretch of unearned runs this season has reached 26 innings over 23 games), and Andrew Miller handled the ninth for his 14th save. But as Girardi pointed out, it starts with the starter, and Pineda was every bit the good one. As if a no-hitter is not difficult enough for a pitcher to accomplish, now they have to deal with all this over-shifting going on in the infield. I was thinking about that Tuesday night as Adam Warren was dealing in the early innings against the Royals. Notions of a no-no entered my head as Warren set down the first 10 Kansas City batters in order with only one ball reaching the outfield. With left-handed hitting Mike Moustakas up in the fourth inning, I watched the Yankees go into one of those shifts with shortstop Didi Gregorius moving to the right side of second base and second baseman Stephen Drew paroling shallow right field. Moustakas withstood the temptation of dumping a bunt to the left side and fouling up the defensive strategy altogether. Instead he swung away and hit a hard grounder between Gregorius and Drew for the Royals’ first hit. Watching the video replay, I felt it would have been a routine 4-3 out against a conventional infield setup. These shifts often give up as much as they take away. Warren did not become unglued in losing the no-hitter; anything but. The righthander set down six more batters in a row before giving up the only run he allowed in his 6 1/3-inning stint on right fielder Paulo Orlando’s first career home run, with one out in the sixth. That made the score 5-1 as the Yankees provided Warren with a comfort zone. Mark Teixeira drove in four of the runs with a two-run home run in the first inning off lefthander Jason Vargas and a two-run double in the fifth off righthander Joe Blanton. Tex scored the fifth run on a sacrifice fly by Chase Headley. It was a positive sign for Teixeira, who had been 1-for-13 on the homestand. He is still an extra-base machine. Of Tex’s 36 hits, 23 (64 percent) have been for extra bases (9 doubles, 14 homers). Batting in front of Teixeira, Alex Rodriguez provided RBI chances by reaching base three times with two singles and walk. A-Rod scored twice on Teixeira hits. After experiencing an embarrassing three-sweep at the hands of the Rangers to begin the homestand, the Yankees have a chance to salvage it Wednesday afternoon by completing a sweep of the more dangerous Royals. Funny how that six-game losing streak seems like ancient history. A group of Yankees players with manager Joe Girardi stood to the right of the plate at Yankee Stadium 10 minutes before the start of Tuesday night’s Yankees-Royals game to greet former U.S. Navy officer and educational professional Richard Albero, who concluded his 1,150-mile walk from George M. Steinbrenner Field in Tampa, Fla., to the Stadium. Albero began his journey March 2 to honor his nephew who passed away in the Sept. 11, 2001 terrorist attacks and to raise money for the Wounded Warrior Project. The final leg of Albero’s trek brought him to “The Bat” by the site of the original Stadium, where he was joined by six Wounded Warriors from the United States Army — Sgt. First Class Shafeek Karamat, Capt. J.C. Brave, Sgt. First Class Jacob Weltsch, Capt. Gregory Backer, Sgt. Rafael Rodriguez and Specialist Anthony Gonzalez. The group walked through Heritage Park, across East 161st Street and up Jerome Avenue toward Gate 2 of the current Stadium. Alberto and the Wounded Warriors entered the Stadium through the left-center field wall and made their way around the left field warning track all the way to the plate. Albero had enough energy left to throw a strike to catcher John Ryan Murphy as the ceremonial first pitch of the game. Aided by a number of support drivers by his side, Albero completed his trip in 86 days. He has already raised around $27,000. The Yankees nearly doubled that with a donation of $25,000. Presenting Albero with the check in the pre-game ceremony were Yankees managing partner and president of the New York Yankees Foundation Jennifer Steinbrenner Swindal and senior vice president of marketing and Yankees Foundation board member Deborah Tymon. To make a donation, please visit richardsyankeeswalk.org. Chris Mullin, the former St. John’s All-America basketball player and new head coach, will throw out the ceremonial first pitch prior to the Yankees-Royals game at 1:05 p.m. Wednesday at Yankee Stadium. As part of the celebration, a special ticket offer with savings of up to 50 percent on select seats for the May 27 game is available for all St. John’s alumni, fans and supporters. For complete details on the offer, fans should visit http://www.yankees.com/stjohns. Please note that all ticket specials are subject to availability. Mullin, a Brooklyn native, is the all-time leading scorer in St. John’s history with 2,440 points, having starred at the university from 1981-85. His teams reached four straight NCAA tournaments and a Final Four in his senior season. After a 16-year NBA career with the Golden State Warriors (1985-97, 2000-01) and the Indiana Pacers (1997-2000), Mullin was inducted into the Naismith Memorial Basketball Hall of Fame and National Collegiate Basketball Hall of Fame in 2011. A two-time Olympic gold medalist (1984, ’92), he was a member of the famous U.S. “Dream Team,” which won the gold medal at the 1992 Summer Games in Barcelona. It looked as if the Yankees took a cue Monday from the Rangers — after Texas left town. The Rangers scored 30 runs in a three-game sweep of the Yankees that included third-inning rallies of seven runs Friday night and 10 Saturday afternoon. The Yanks put on such a show in the first inning Monday against the Royals, who came to town in first place in the American League Central. Yankees hitters reacquainted themselves to the cozy right field porch at Yankee Stadium with four home runs in the first two innings off Kansas City righthander Jeremy Guthrie, who was absolutely dreadful to the Yanks’ delight. The Memorial Day crowd of 36,031 had barely gotten comfortable in their seats when Brett Gardner led off the first inning with a double and Chase Headley drove the next pitch into the right field bleachers. A single by Alex Rodriguez and a walk to Mark Teixeira set the table for Brian McCann, who knocked a 1-2 pitch over the right field wall to make the score 5-0. And the Yankees were not finished. Far from it. Two outs later, Guthrie hit Didi Gregorius with a pitch and allowed a single to Slade Heathcott. Gardner got his second extra-base hit of the inning and the Yankees’ third home with a three-run blast for 8-0. Another three-run homer, by Stephen Drew, ended Guthrie’s day before the first out of the second inning. Guthrie faced 16 batters and let 13 of them reach base with 11 of them scoring. Now the Yankees know how the Rangers felt over the weekend. This one was as upside as it gets. Nathan Eovaldi pitched into the eighth and limited the Royals to one run, and the Yankees kept pouring it on toward a 14-1 final. Headley got his third RBI of the game in the fifth inning, and Heathcott added two more runs in the seventh with his first career home run, the fifth of the game for the Yanks, all of which were hit to right field. Heathcott’s dinger came off Greg Holland, one of the toughest relievers in the majors. Heathcott, just up this week from Triple A Scranton/Wilkes-Barre to help the Yankees get through the loss to the disabled list of Jacoby Ellsbury, has been the rare scent of fresh air lately. He is batting .455 (5-for-11) with a double, a homer and three RBI and has fared well defensively in center field. His Yankees teammates did not play any games after his first major-league homer, perhaps cognizant of his hard-scrabble road to the majors following off-field issues of substance abuse. The former top prospect was dropped from the 40-man roster by the Yankees, drew no interest elsewhere, re-signed a minor-league deal with them and was returned to the roster last week. Heathcott was even able to get the milestone ball from a group of fans in the right field stands. It was also an eventful day for Jacob Lindgren, a lefthander who made his big-league pitching debut with two scoreless innings of relief (no hits, two walks, two strikeouts). Every player in the majors recalls vividly similar experiences they had to connect themselves with what Heathcott and Lindgren did Monday. This was indeed a Memorial Day to remember. 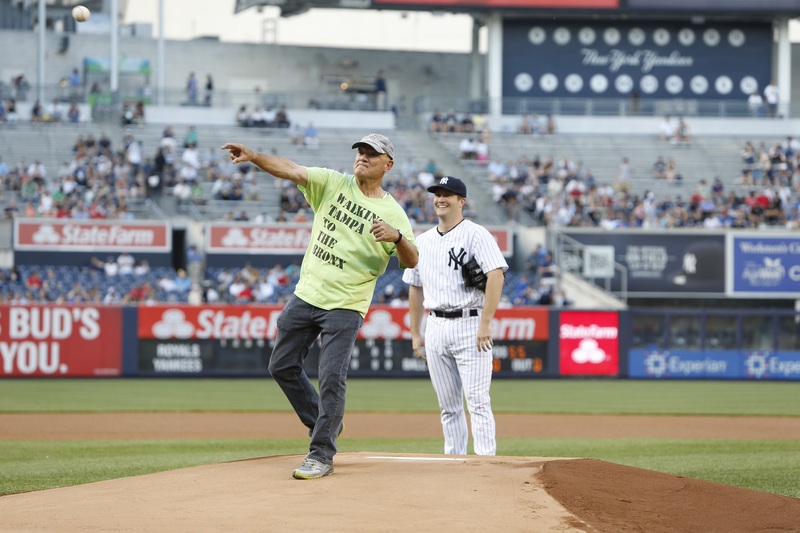 Bernie Williams, a man of few words in his playing career, was downright eloquent in his remarks Sunday night in response to the Yankees’ presenting him with a plaque in his honor in Monument Park and retiring his uniform No. 51. Williams, whose last season with the Yankees was in 2005, was joined on the field by his mother, Rufina, his brother and his children as well as former Yankees executive Gene Michael, former manager Joe Torre, former coaches Roy White and Willie Randolph and former teammates David Cone, Tino Martinez, Paul O’Neill, Andy Pettitte, Jorge Posada, Mariano Rivera and Derek Jeter. Williams thanked Michael “for not trading me” when he was a younger player. He thanked White for helping him with his left-handed stance that made him more effective as a switch hitter and Randolph for the advice never to be afraid of success. He also thanked his old teammates for all their support during his 16-season career, all with the Yankees. Manager Joe Girardi, another former teammate of Williams, presented Bernie’s mom with a bouquet of flowers. Stephen Swindal Jr., grandson of the late Yankees owner George M. Steinbrenner, presented Williams a replica of his plaque. Yankees managing general partner Hal Steinbrenner present Bernie a milestone, diamond ring embossed with No. 51. The years were filled with great memories on teams that won four World Series titles and was on the losing end of two other World Series, of exciting Division Series and League Championship Series games. Sunday night was yet one more.